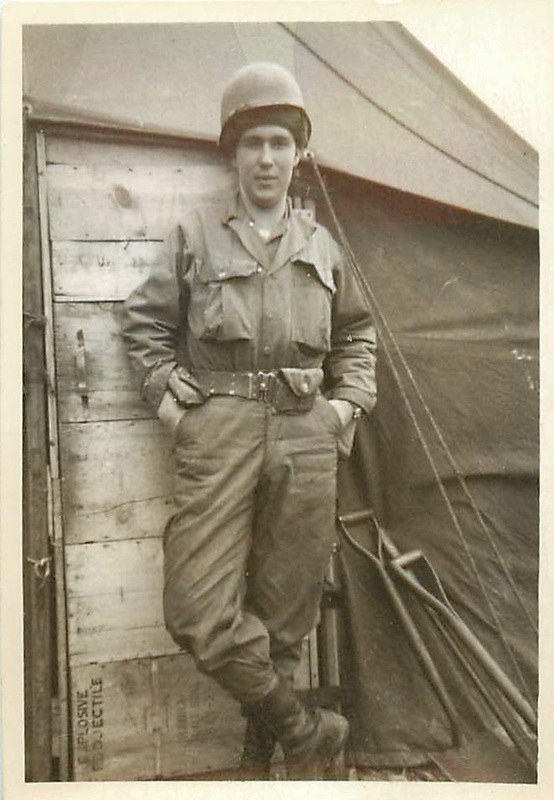 During his basic training and cooking school, Bill was part of the Sixth Army based in the Western States. The red star souvenir was the Sixth Army emblem. He was also issued a travel guide by the Sixth Army which stressed the importance of representing the Army well while traveling in uniform. Sixth Army Red Star uniform patch and travel guide. 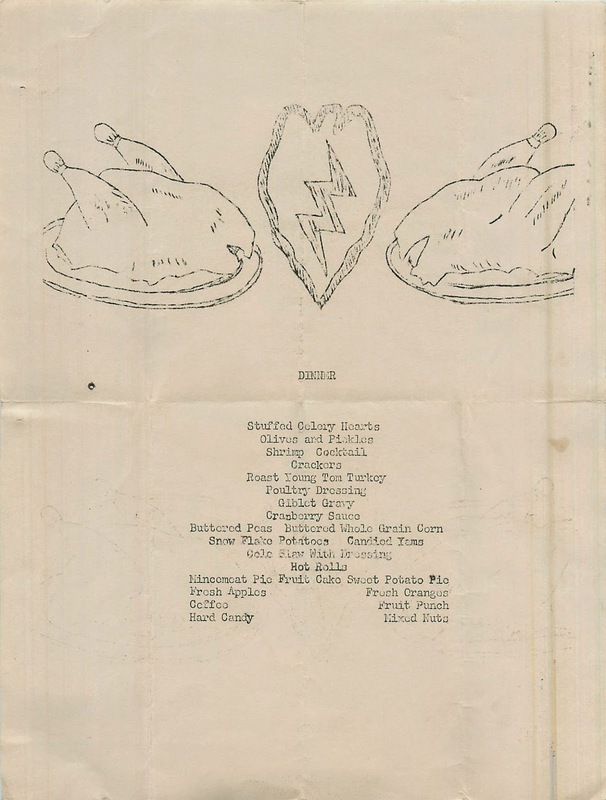 The Thanksgiving menu from 22 November 1951 was a meal that Bill helped prepare. In addition to a Roast Tom Turkey, dressing, gravy and cranberry sauce, the menu included stuffed celery hearts, shrimp cocktail, buttered whole grain corn, snow flake potatoes and candied yams. For dessert the soldiers were treated to mincemeat pie, fruitcake and sweet potato pie. These treats were supplemented with fresh apples, fresh oranges, hard candy and mixed nuts. Four or five cooks were on a team. They worked one day on and one day off. The Koreans in the photo did the KP duty. Group of Koreans that performed K.P. for the Mess Unit. His unit was Battery A 64th Field Artillery of the 25th Division. 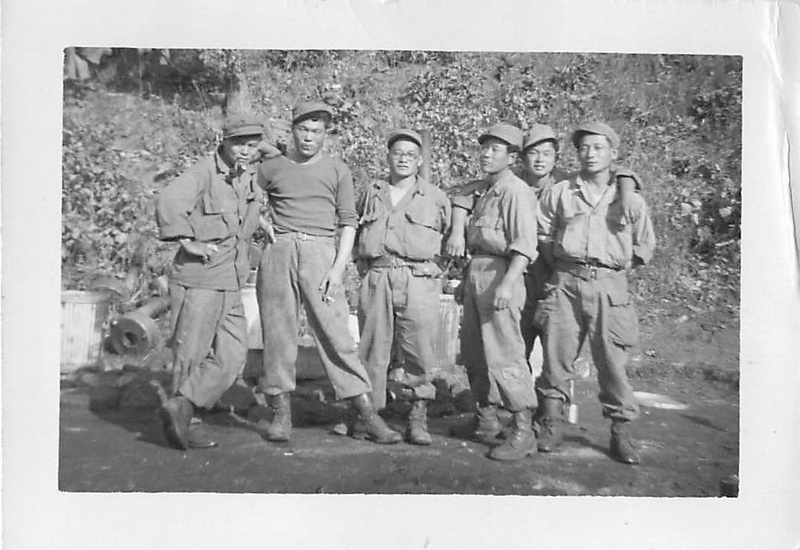 A website has been created for this unit for memories and reunions at http://www.koreanwar.org/html/units/64fab.htm. Lt. Edwards was the mess officer. He was good as he could be. It snowed and Edwards had to relieve somebody. Bill offered to drive if Edwards would get a weapons carrier. This vehicle is a light truck designed to carry machine guns or mortars and their crews. Bill also drove a water truck. 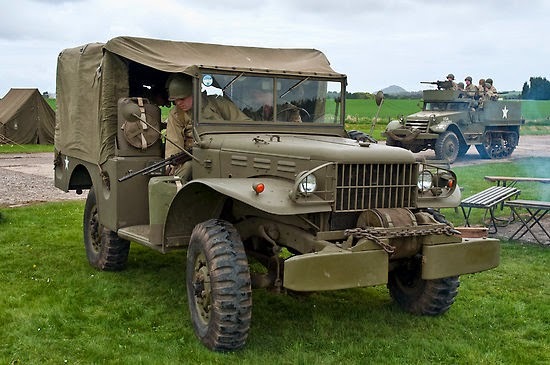 After Bill took Edwards to the front line, he was permanently assigned to driving the weapons carrier. He had it easy on that assignment. He only had to work an hour per day. Every veteran who served in the United States Armed Forces during the Korean War was assigned a Military Occupation Specialty or MOS number. Bill recalled that the MOS number for a cook was 3060. 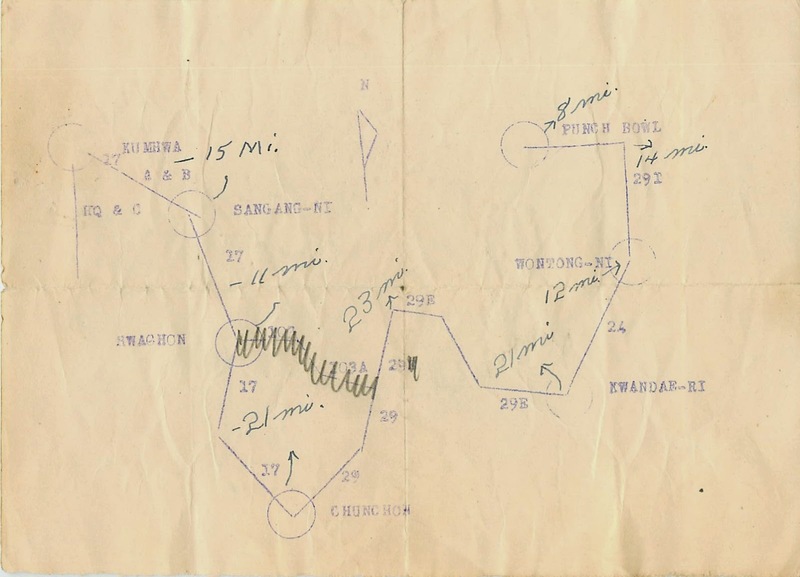 Hand drawn and mimeographed map of area where Bill worked. The map shows the areas where Bill worked in Korea. The most southern point on the map is Chuncheon (Chunchon). Chuncheon is a Korean city with a long history. The city was largely destroyed during the Korean War during the Battle of Chuncheon. Because of its strategic location, Chuncheon continues to be known for the large Korean bases in the area. Until recently there was also a US military base, Camp Page, in the city across from Chuncheon Station. Camp Page is still in use by the Republic of Korea Army as an army aviation base. Many reservoirs have been constructed in the area and they have become a tourist attraction. On the shores of Lake Uiam is the Peace Park, a memorial to the Battle of Chuncheon. . The battle was one of the first fought in the Korean War on June 25, 1950. South Korean defenders soundly defeated a superior North Korean force, stalling the invasion and allowing time for the South Korean army to regroup. Bill wrote to Irma on September 4, 1951. He wrote the letter on special stationery that folded into a letter. He sat outside his tent and wrote on his shaving kit that Irma had sent him. “…Honey this is nothing like what I thought war is like or maybe I haven't seen much yet. I sure hope I don't see any more... There is a Korean that washes our clothes for us cooks every day now. Sure is nice. I sure am glad that I'm a cook..."
Punch Bowl was the last place he was assigned. The Punchbowl is a natural geologic bowl created by an extinct volcano. It measures several miles across and is surrounded by steep mountains on three sides. The Punchbowl contains some of the richest farmland in South Korea. One of the hardest fought battles for the United States Marines in the war occurred in late August through mid September 1951. Fortunately for Bill the area was somewhat more secure in 1952. When Bill left Korea, he was sent to Japan. The officers at the processing center stripped him down took all of his personal belongings and gave him a new uniform. The only thing he got to keep was his helmet. He had a picture of Irma inside the helmet. 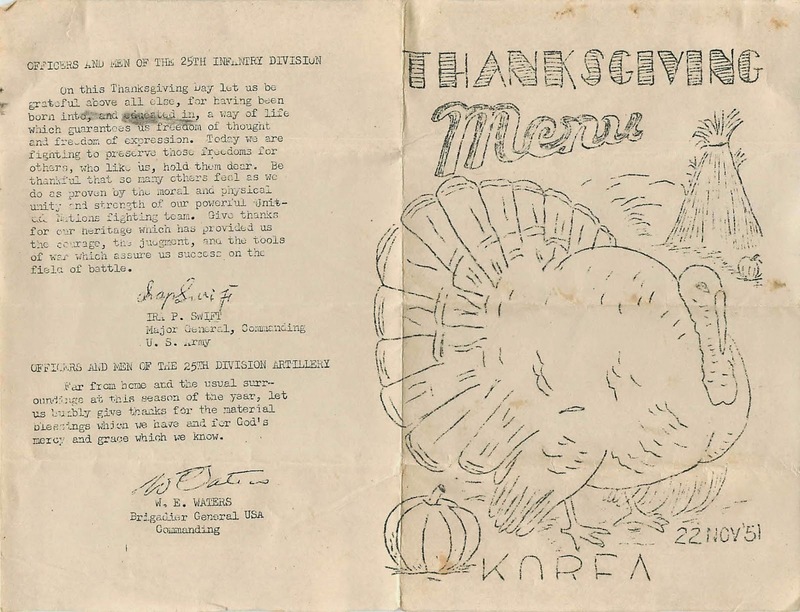 Bill came back from Korea on the troopship USS General Randall. Bill volunteered to work in the kitchen. Somehow they got the key to the freezer. They took a block of cheese and box of crackers. The guys went up on deck and ate the cheese and crackers. The ship docked at Fort Mason in San Francisco on July 2, 1952. Bill and Irma saved a newspaper called the San Francisco News with the headline: “VETS HOME ON 2 SHIPS”. There were 1825 passengers aboard the General Randall. Of these, 565 were Army personnel; 11, Navy; 1088 Air Force; and 171 dependents and civilian employees, all from the Far East chiefly Japan. The Army band welcomed the group home with “California Here I Come” and other popular songs. 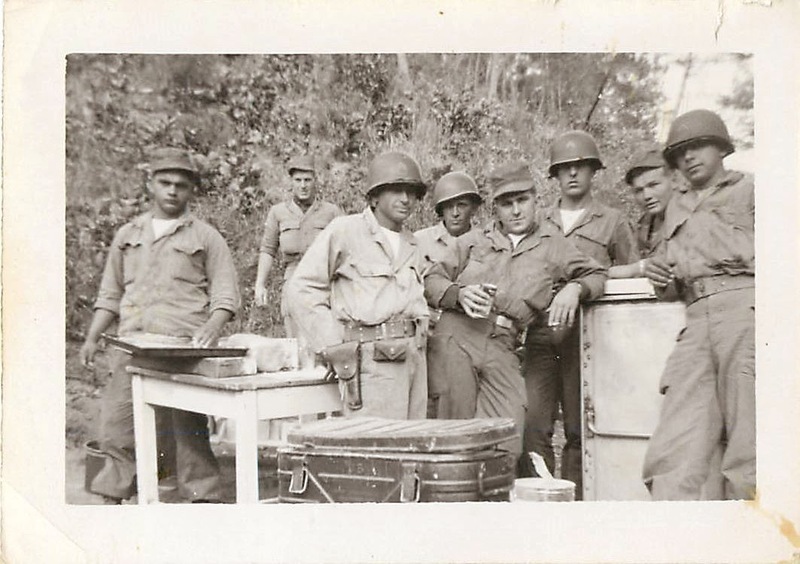 The Red Cross served cookies, coffee and fruit juice to the returning soldiers and airmen. Also on the front page of the San Francisco News that day was an article stating that American battle casualities had reached a total of 111,576. Bill managed to avoid becoming one of those statistics. The final figures for the Korean War were 36,516 dead, 92,134 wounded and total casualties of 128,650. The Army personnel were taken in a ferryboat to Camp Stoneman in Pittsburg for processing. The concession stand on the ferry boat sold out before they got to Camp Stoneman. Then Bill went to Camp Roberts to be reassigned just before the 4th of July. Everyone was gone for the holiday so all of the soldiers hitchhiked out of there. Bill went to Jay and Ruby Fitzpatrick’s home in Daly City. Bill was back to Camp Cooke after the July 4th holiday. Irma was with him at Camp Cooke in September 1952 working as a stenographer. Bill was discharged at Camp Cooke which later became Vandenbergh AFB. Bill went on a bivouac to Hunter Liggett. A bivouac is usually a temporary encampment under little or no shelter. Bill advised on how to set up a field kitchen based on his Korea experience. The recruiter offered him Master Sergeant if he would stay in but he did not want to return to Korea. Bill was transferred to the Army Reserve on 25 November 1952. 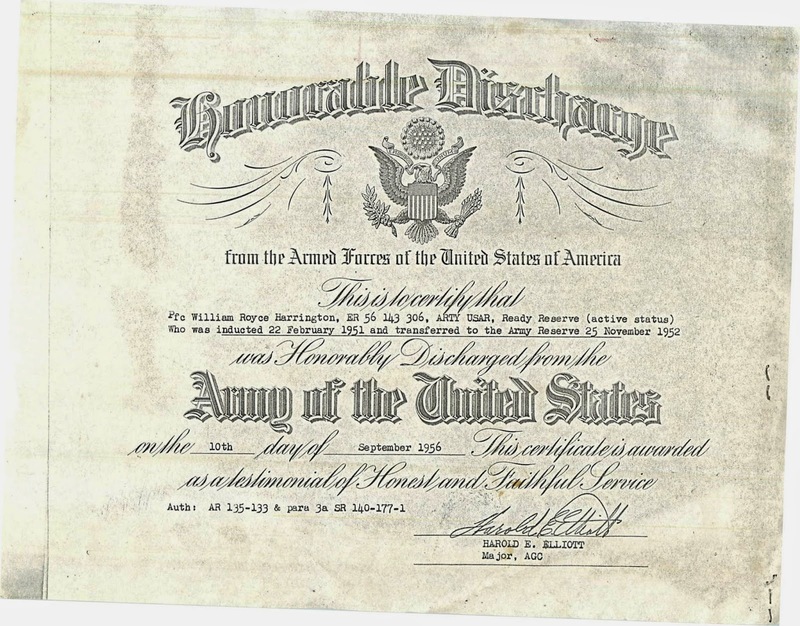 He received his Honorable Discharge on 10 September 1956. Fun with Names, Dates and Places!